You'll be £25.00 closer to your next £10.00 credit when you purchase Rails Across North America. What's this? The railways of the USA have a great following, not only in the United States (where there are large numbers of rail fans) but also increasingly in Britain and Europe, where there are enthusiasts who regularly visit and model North American railroads. The number and variety of these railway operations is both colourful and interesting to enthusiasts, especially the British who are more used to rail transport of a subdued and staid nature. In addition to the major mainline companies, there are numerous short line and industrial concerns who run equally interesting train operations. 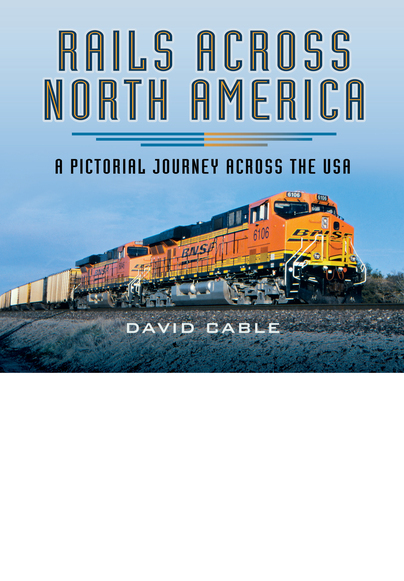 David Cable has visited the USA on fourteen occasions and has travelled extensively across most of the states, photographing railroads of every shape and size. This book will not only interest enthusiasts in Britain and Europe, but also rail fans in the USA. If modern diesels and electrics float your boat enough to cross the Atlantic, these books are for you. A snapshot of what is out there, and if it is your scene, both books are buyers' delights. Aimed at enthusiasts, modellers, and a wider public, this certainly shows the great variety of North American railroads from class 1 roads to shortlines, from small switchers to multiple unit lash-ups, and so makes an excellent 'sampler'. Any US fan should be happy to get it as a gift! It is truly a visual feast for anyone with an interest in the subject matter, and good value given the number of pages.